It turns out, right, that if you're planning on catching a ferry at 2am on a Saturday and following that up with a 6.5 hour drive across and down a good chunk of England, then the very best thing you can do on the Thursday night is to go out and see some comedy, then go drinking till three in the morning. It is also important that you get no nap on the Friday at all, so that your driving ozzyssey across England is filled with the kind of unfitness to drive that they make road safety ads about. Nevertheless, this is what we did. 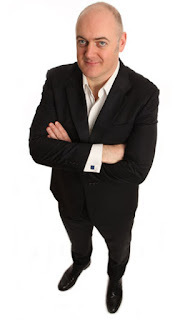 Last Thursday we went to see Dara Ó Briain in Vicar St during his current round of gigs there. It's quite a while since we last saw him here (can it possibly be this long ago? This seems too long ago. I must have just not blogged the last time, surely) on his own, but we did see him in December at the Console gig, so we hadn't completely forgotten the fast talking (mrmonkey's American colleague found it difficult to understand him every now and again), the manic hand gestures (in fact, his show has become more physical, and is all the better for it. He's got a gift for a bit of physical comedy), and the audience interaction, which is sometimes disastrous but actually worked really well last week. In the audience were not one, but two people who had saved the lives of others. There was also a woman who had gone through a period of having slightly predictive dreams that foretold entirely inconsequential events, but she hadn't had one since the mid 1990s. One of the things I really enjoy about Dara's gigs is the fact that I can relax, knowing that he's not going to pull out a load of material about fat chicks or how women be shoppin'. He's not going to take the piss out of the old ball and chain, (indeed, most of the stories involving his missus are highly complimentary) or even shite on about football (even though he loves it). Of course, I'm in a privileged position here. If I was a homeopath wearing a badge saying "Let Us Drive Out Blasphemy As St. Patrick Drove Out The Snakes" I might feel differently. But even then, Dara has a way of arguing against the action rather than the person. He does have a section where he talks about old midwives' tales, but even then, he's very clear that it's only the "don't let the surgeons get you, with their knives" part he has a problem with, not the "hey, let's get you squared away and get a healthy baby out of you" part. Maybe I should feel left out for not being a gamer, but even his section on computer games, which has the potential to be alienating to non-gamers, is put together in a way that includes everyone, because he creates a lovely fiction around first-person shooters that opens the routine up to anyone who's watched films. So, to recap. If you are into blasphemy laws, you fear modern medicine and women, you don't watch films or play computer games, and you want to hear a lot about football, I recommend you go elsewhere for your comedy. For anyone else, I recommend you get a hold of some tickets to see Dara if you can.